So, what if you don’t believe in Bigfoot, ghosts, or aliens? What do you do with friends and people who do believe in that stuff? Well, you don’t have to fight everybody and be left without friends. You don’t have to argue about everything. You overhear people talking about aliens or magical bracelets? Whatever floats their boat, man, good for them. Your friends are talking about Slender Man… well, sorry for them. But what if someone asks you your thoughts about something? What if they show you a video or a picture or an article that they say is proof of something? Like, Bigfoot or an UFO or ghosts? Consider the source, where this is posted: is it on an educational Website, a scientific Website, or just someone’s personal Website? Who is telling you this thing? Is it a scientist, someone professional who has studied the thing they are showing you? Or is it some random guy who according to his own opinion, this thing must be what he says it is? Think about why they posted this: it could be to simply entertain (because it’s funny, cool, or interesting), it could be a hoax, it could be advertising (you know, to get you to buy something), put there just to get Likes, Subscribers, or Followers. Bigfoot (or an alien, or a ghost, or whatever it is they are claiming). It is your friend’s job or whomever is showing it to you, or the YouTube channel -it is their responsibility to prove it to you, with scientific evidence. They’re the ones making this big claim so they are the ones that have to prove it. And just saying, “well don’t you see it’s blurry, don’t you see it looks like Bigfoot?” -that’s not proof. “Well, the guy who took the video says it’s real” -that’s not proof (remember that people can lie, or it can be a hoax, or advertising, or just unknown). “But how do you explain that sound, or that bottle falling by itself?” -you don’t have to explain it. You don’t know how it happened it, you weren’t there. But that doesn’t mean it’s a ghost that did it. The point is, don’t immediately believe what you are looking at or listening to. 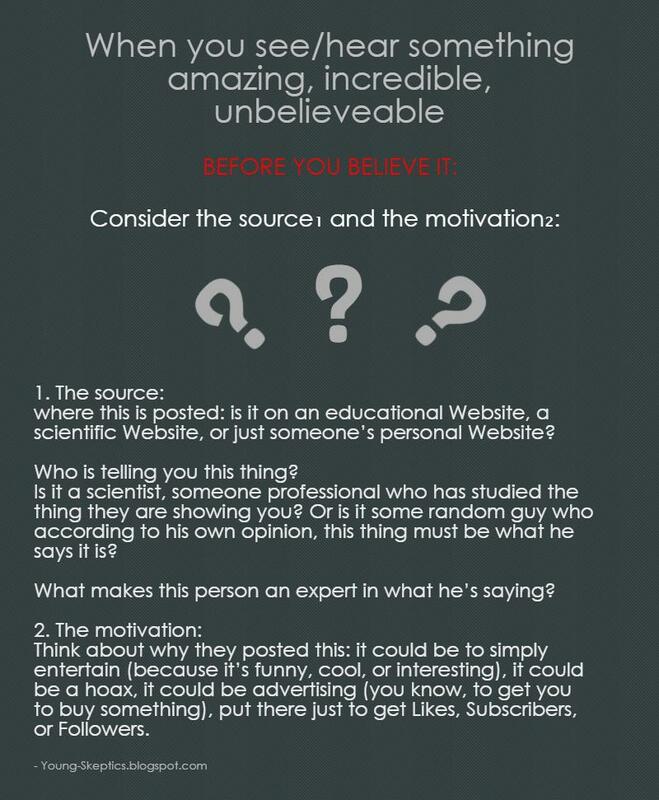 Consider the source and motivation (like we explained above). And, you don’t have to prove or explain that whatever it is is not what they say it is -it’s them that have to prove (with facts, scientific evidence) that it is what they say it is. They’re saying something incredible so they have to prove it. At the end, you can agree to disagree and keep your friends. VIDEO: How to evaluate a Website: GCSCL Library. 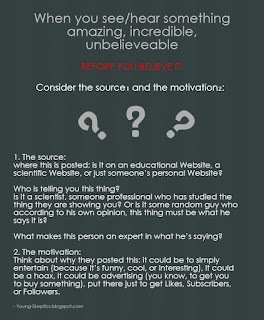 Learn how to recognize a bad Website: Info Today. PRACTICE how to decide if a Website is good or bad: Media Smarts.